Thursday was Day 2 in Team Tizzel's Dopey/Grumpy Challenge. We had barely been in Orlando for 48 hours and we were already onto our second race of the weekend - and getting tired. 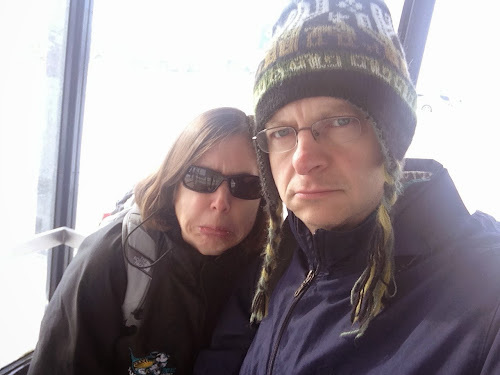 To hit some highlights: We flew into Orlando from Chicago on one of the worst travel days in history due to bitter cold. We arrived safely after being booked on 3 different planes and having our luggage lost. On Wednesday we survived the race expo, changed hotels, spent time in the Magic Kingdom, had drinks at Top of the World Lounge, dinner at California Grill, and drinks with friends at Bell Vue Lounge. 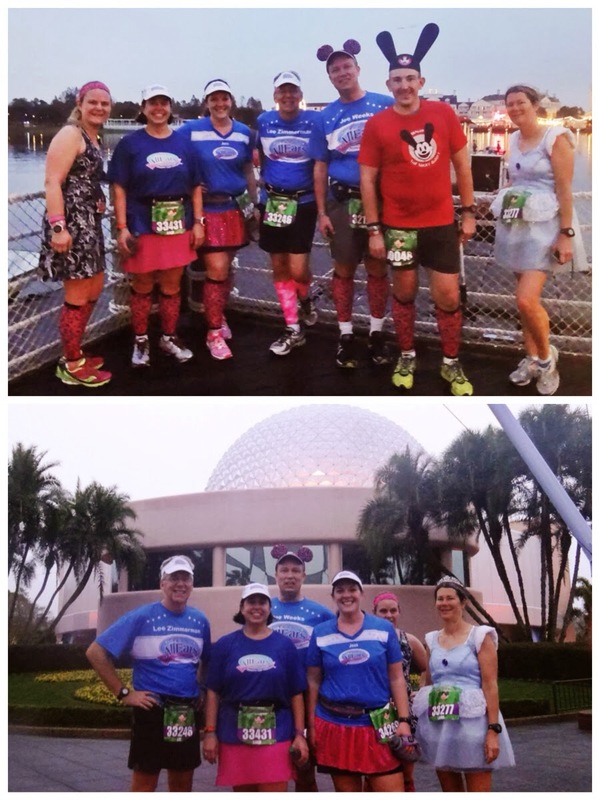 Thursday we had the 5K, spent time in Animal Kingdom, toured around Epcot, and dined with friends at Teppen Edo. Friday's 10K was an inaugural event. The new course took participants outside the main Epcot toll booth, around a few overpasses, then into Epcot's backstage behind Test Track. It wasn't until after the 3.5 mile mark that we that we entered the park. The course circled clockwise to the International Gateway for a loop of the Epcot resort area. Then it was back to Epcot with a tour of backstage between International Gateway and Journey into Imagination. 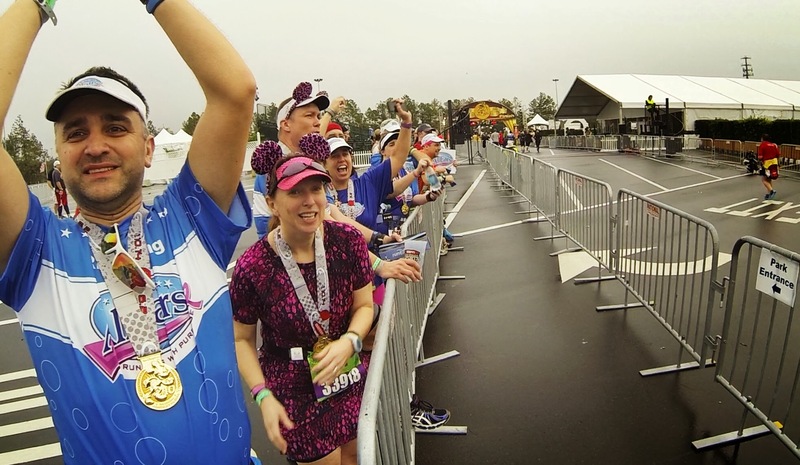 Finally, the course cut through the center of Future World and took participants backstage to the normal finish line route. For this race we joined up with about ten friends. The plan for the runners was to have a faster pace than the day before and get used to doing run/walk intervals with each other. Dave's plan was to walk faster than the day before at a consistent pace. At times he'd be infront of the group and they'd catch up, or he'd be behind and catch up during their walk breaks. The morning was a bit interesting. Michael was throwing up the night before - not sure if it was food poisoning or viral. Holly placed him in personal quarantine. Eddie had an Oswald theme going while Dave wore a fake mustache all morning. Most of us were wearing pink cheetah compression socks as a symbol of our support of breast cancer awareness. (Michael chronicled a weekend with Eddie when they attempted the #Goofyinaday Challenge back in November here on Team Tizzel. Visit their adventure here). It's good to be friends with the race announcer. As we left Corral C we got a big shout out for Team AllEars and Team Tizzel! Within the first tenth of a mile Dave ditched the mustache - it wouldn't stick. After a few minutes we all realized it was really humid. REALLY humid. This gave us some concern for the next few days of races. Our group was together most of the first few miles, some going faster than others or doing different intervals, but in general we were all in line of sight of each other. There was not much to look at until we hit the Epcot backstage guard house. Disney's entertainment before that point was one character stop (Peter Pan theme) and a big video screen playing music videos from the Disney Channel. We entered World Showcase between Norway and China - that was different in the fact that it cut out a typical bathroom break opportunity. Next bathrooms were in Germany. It was still pretty dark so the pavilions had their night time lighting on and looked very nice. 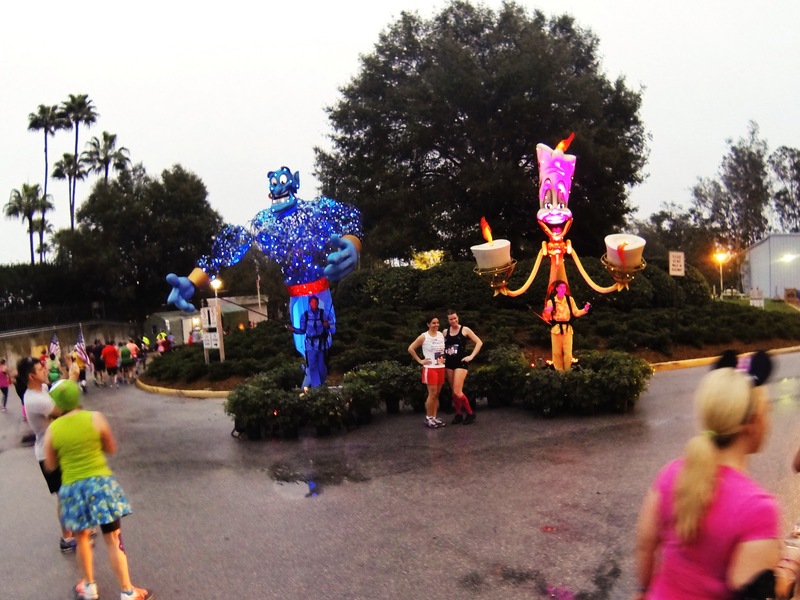 It was fun to go through the Epcot resort area too. Lots of spectators and the sun putting a nice light over the Beach Club. It was fun to have some friends cheering for us on the Beach Club/International Gateway Bridge. When we reached the Swan and Dolphin Hotels Dave went ahead of the rest of the group. We know there are people that have a hard time walking and chewing gum at the same time - Dave can't hold conversations and walk at the same time. He's more of a bury your head and chug it out kind of walker. Dave was also secretly planning to attempt a certain time goal for the half the next day and today's pace was not giving him any confidence. Add to that the stress of waking up to a broken GPS. Between the humidity and the difference of being on a crowded race course vs. training he was doubting he'd make his half marathon goal. There was a mobile DJ in the Epcot backstage area by Soarin' and a few characters in World Showcase and Future World. There were some giant puppets near the 6 mile mark. Not much entertainment overall on the entire course. Instead of finishing alone Dave waited the short few moments for the rest of the group to arrive so he could film all the finish line fun. We received our medals with a little hassle. 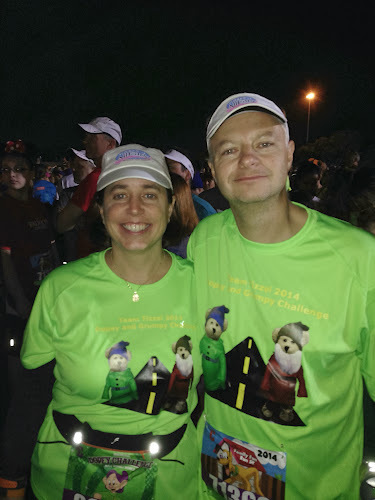 runDisney screwed up Holly's registration and placed all her info under Dave's name. They eventually fixed their records but did not fix her race bibs so her tag read "Dave". The person whom gave her the medal said "Nice Job DAVE". She was concerned at some point someone would think she bandited the race and her Dopey could be forfeited. One more thing to stress over. After we got our snacks we joined some other Team AllEars friends in the spectating area before the finish line to cheer in more friends and other race participants. We saw the last person cross the finish line. Overall we had a fun morning with our friends even though most of the course was lackluster. It wasn't very fun to have nothing to look at for over half the race - especially all upfront. 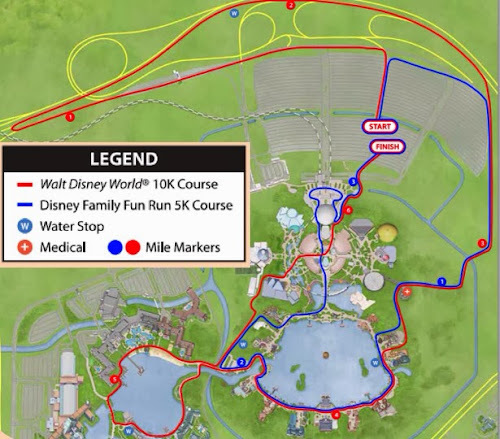 It would have been awesome if the back part of the course looped to make up the 6.2 miles. Holly gets to run this course again in a few weeks as part of the Glass Slipper Challenge for Princess Half Marathon Weekend. Dave will be sitting that one out. Dave brought the GoPro out on the course and managed to salvage a cohesive story out of a ton of shaky videos. Underneath Our video is our friend Eddie's video. He started a new Facebook page for his race videos which you can find at Fast Eddie Videos. 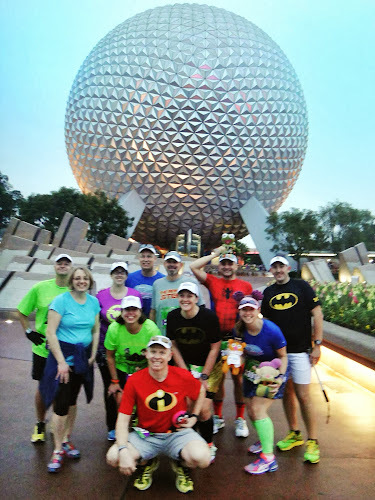 On Thursday of Marathon Week we participated in runDisney's first race event of the week: The Family 5K. This was our fifth time doing this specific race and we noticed a few changes. First, it was earlier than prior years. Second, it was bigger..... there were about 10,000 people organized into 5 large corrals. Next, no strollers were allowed this year - for the Family 5K. 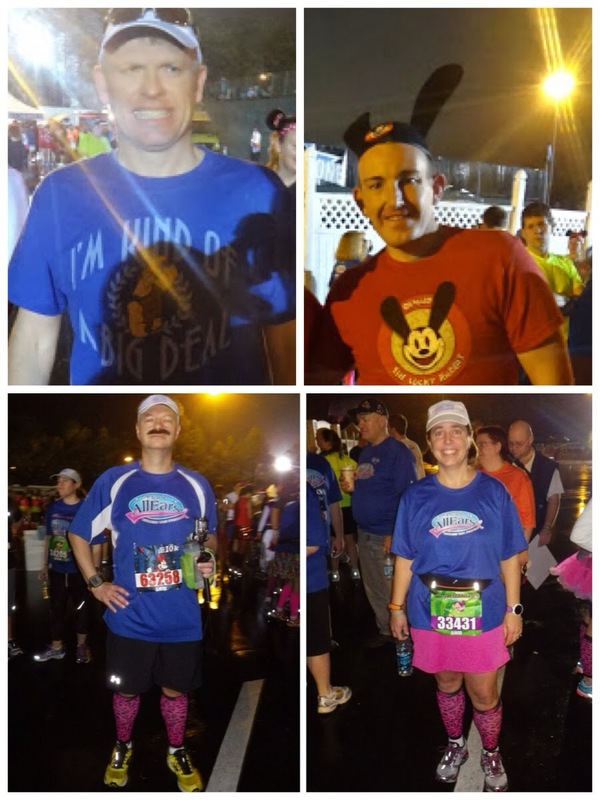 Since runDisney made this race part of the Dopey Challenge (4 race series during the weekend that yields extra bling) 7,000 of the approximate 10,000 spots were filled by folks whom were instructed to keep to the 16 minute mile pace. So the Family 5K had to become less family-friendly. 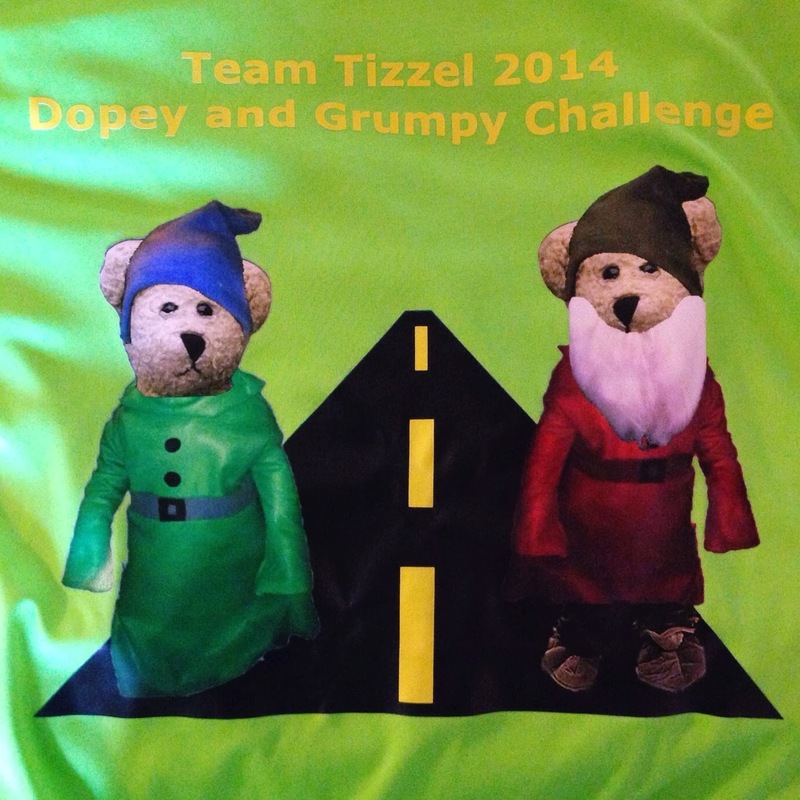 We met up with our Team AllEars friends before the event and unveiled our Team Tizzel shirts commemorating the weekend. We dressed Tizzel up as Dopey to represent that Holly was doing The Dopey Challenge. We a,so threw in Tizzel as Grumpy since Dave was doing the unofficial Grumpy Challenge, consisting of the 5K, 10K, and Half Marathon. 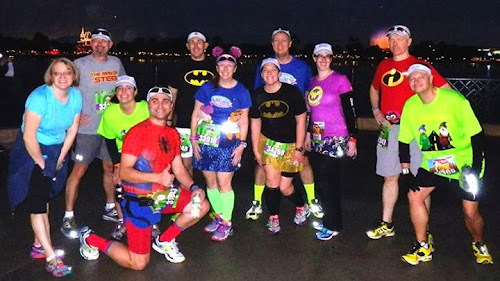 At other times runDisney awarded an extra medal for 10K/Half Marathon combos. This time they didn't so we are therefore Grumpy. 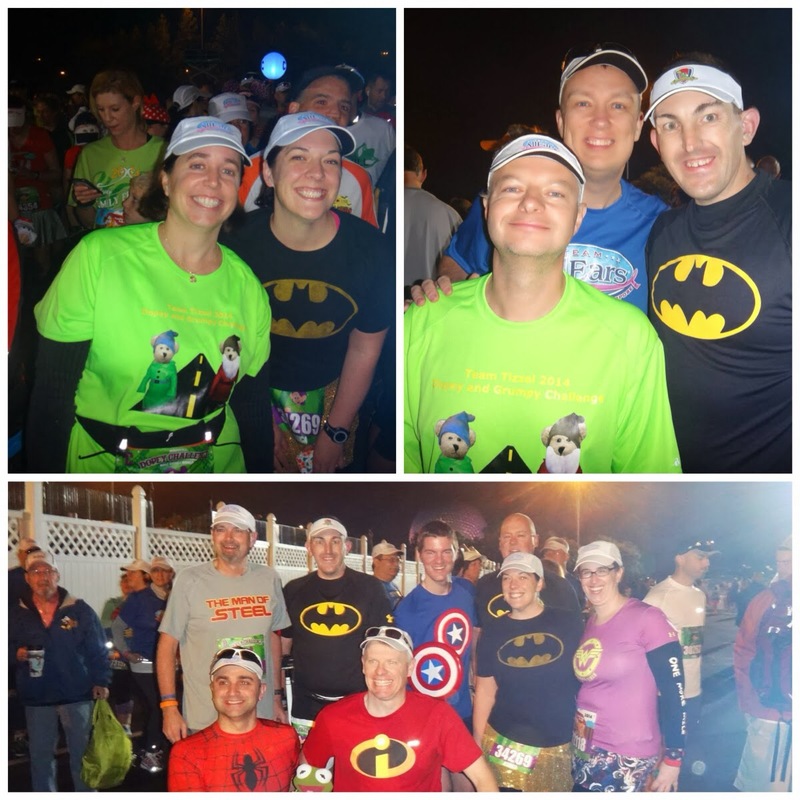 We did the race with a dozen or so of our friends. The goal was to keep it simple since most of us had other races to do the rest of the weekend. 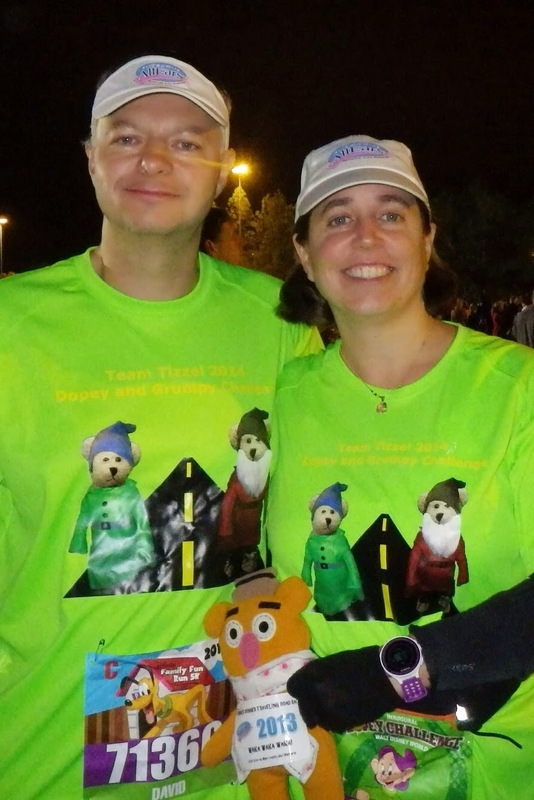 But of course there was the concern over the time requirements for Dopey Challengers, which meant we should try to finish in the 16 minute per mile requirement (something we have yet to accomplish). So we were relaxed, but not too relaxed. As far as the actual course goes: Mile 1 is through a parking lot. This is boring. What used to make this portion tolerable was seeing some of the junk they threw on the side of access roads like old parking trams and Jungle Cruise boats. Well, Disney cleaned up those areas so there's nothing interesting here anymore. You hit Mile Marker 1 right before getting to a guard house securing some backstage areas of Epcot. It's a few more tenths of a mile before you come out onto World Showcase at Mexico. This is where the fun starts. Music is blaring, the lagoon torches are lit, and there are character stops. All of the characters were repeats from prior year events. Dopey was in Germany with a huge line filled with Dopey Challenge participants. After you pass Mile Marker 2 at the Friendship Boat dock you go backstage of the UK pavilion before coming out by the red phone booths and continue on by Canada and down to Future World. For the last few tenths of a mile of the race you go through another backstage area and then finally finish in the parking lot. We didn't take too many pictures. The Dopey Challenge requirements were in the back of our minds so there was no time to wait a few minutes for pictures with characters. It was darker due to the early start so Epcot was not as pretty as it usually was during this event. Additionally, we were just having fun chatting with our friends so we were a bit distracted to think of photos. We did get a few in along the way. Yes those are Disney Pook-a-Looz dolls. Click here to get the backstory. Overall we had a great time at this event. We would have rather it had been left out of the Dopey Challenge to keep it a true family event like it used to be. Not sure how he managed it, but Eddie actually did make a video of our time during this race. At the end you can hear race announer, our friend Rudy Novotny, call us out by name and give a shout out to Team Tizzel! If you have read our guide to spectating distance races (which you can purchase at racechasebook.com) you know that Dave hates race expos. Disney's especially..... Every year we spend hours at the expo picking up race packets and shirts, handling every single piece of merchandise (twice), waiting in line to pay for the merchandise, and shuffling through hoards of people looking at the exhibitor booths, Usually we have to park in some dirt lot and can never find the car when we are ready to leave. We took a different approach this year. Instead of showing up at noon we arrived at the expo an hour before it opened. We didn't have to park in dirt. Upon approaching the Wide World of Sports Complex we saw a pretty long line. Thank goodness that was for the exclusive New Balance runDisney running shoes. The line we needed to be on was much farther up and shorter (at Packet Pickup on the picture). It ended up being real short for us since our friend Joe (whom had received our race info via email and had all our paperwork with him) was 4th in line and people were cool and let us hang with him. When Dave came back from the bathroom the line was gone. They opened 45 minutes early. Here is the building layout. 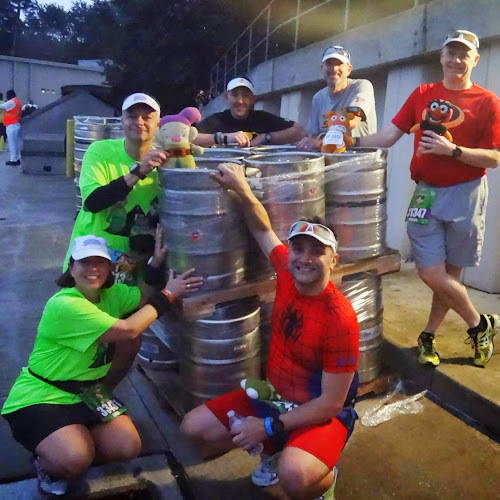 In Packet Pickup you get your race numbers and handle any registration issues. There's a small runDisney merchandise section here. After you get your packet you are sent to the back of the expo hall to pick up you pre-paid race shirt. 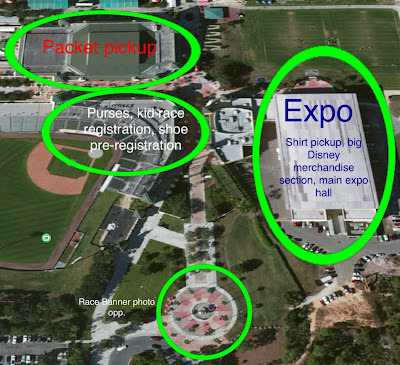 In the expo hall you have vendors, exhibitors, the big runDisney merchandise area, and a small lecture area. The stadium's apron had the Dooney and Bourke race-themed purse, Kid's races registration area, and the pre-registration area for the shoes (you waited on line to give some info to the shoe people, then they text you when you can actually come back and buy the shoes). Dave knew the strategy, but was shocked by the early entry. He went to Packet pickups runDisney merchandise section and saw Joe running around flailing his arms while Holly stood in front of a pile of clothes on the ground. After both Joe and Holly started yelling "We are not divided" Dave received his instructions of what to look for in the other building (that wasn't already in their massive pile) and took off to the expo's runDisney merchandise section. upon getting there he grabbed a Dopey "I did it!" shirt that was not in the other building and one of everything else Dopey in Holly's size. The area was not crowded at this time and several friends came through so he wasn't bored. Holly and Joe finally arrived, Holly made her decisions, and we finally got out of there. 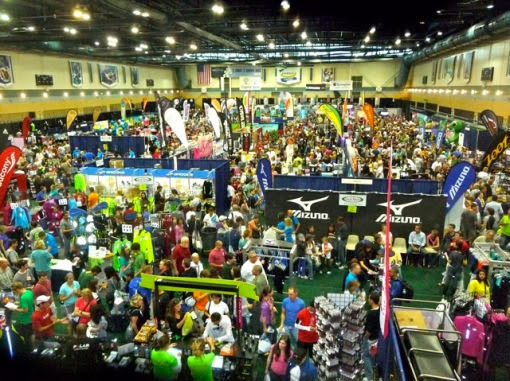 We walked the expo booths, then went back to packet pickup for our race bibs. after that, back to the expo for our race shirts and got out of there. We were in the expo for a little over two hours. By the time we left the shoe line was about a quarter-mile long. Overall this was a decent strategy for navigating the expo. Definitely not as painful as other years. 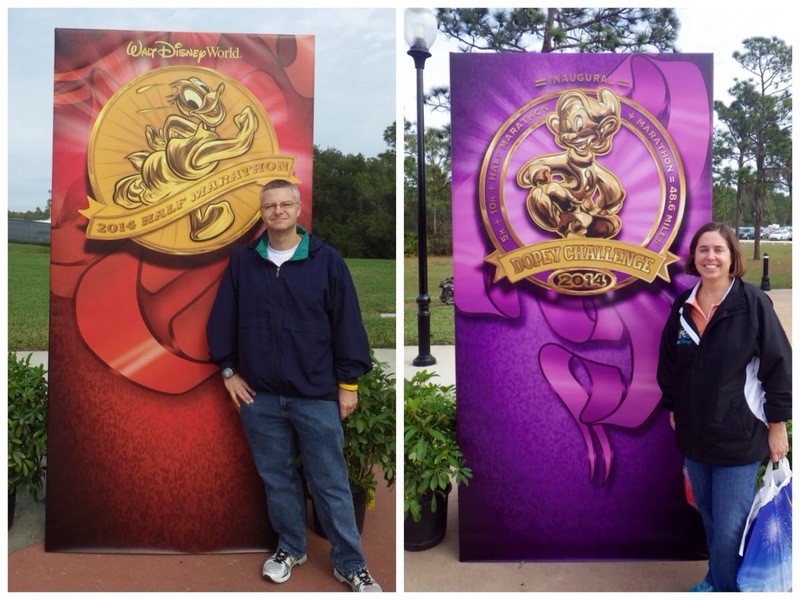 We took some obligatory shots by the race banners and then headed off to check-in to our new hotel, hit the Magic Kingdom, have dinner at the refurbished California Grill, then meet friends back at our hotel for drinks. Eventually we had to go to bed since we had our first race, the 5K, in the morning. 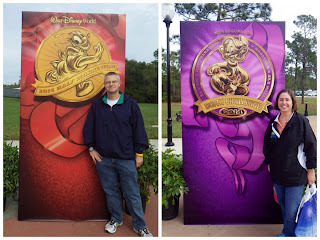 We were to leave Tuesday January 7th for Walt Disney World's Marathon Weekend. 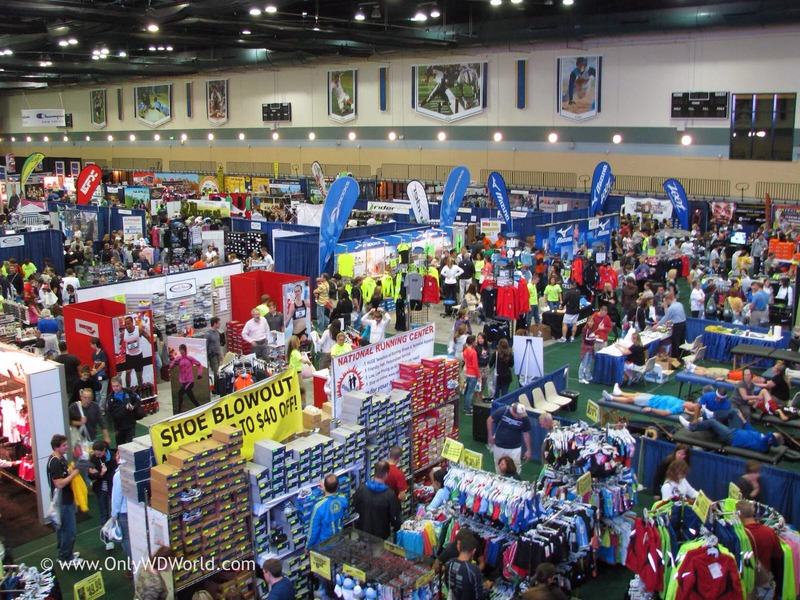 The first race was Thursday morning, but you need to be at the expo the day before your race to pick up your bib and to have the best chance of getting all your desired race merchandise. 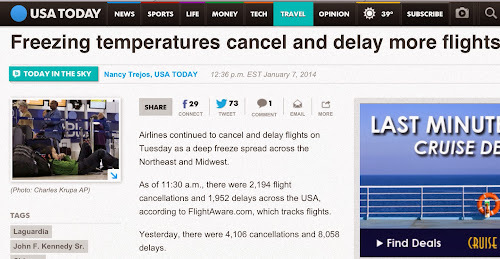 At 10am our late-afternoon flight to Orlando was still scheduled to leave on-time. At 10:30 Holly called Dave to let him know the flight was canceled. He was at the ATM in his building at the time so he had to run up to his workspace so he could grab an empty cubbie-hole (his office has open seating with no desk phones) and call the airline. 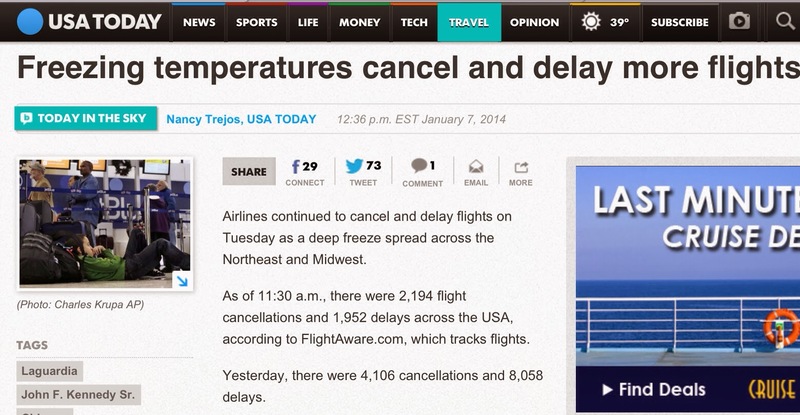 There was one more flight to Orlando from O'Hare that evening, but it was booked. So the next goal was to try any other Florida airport. Tampa (90 minute drive) had a connection through Miami. 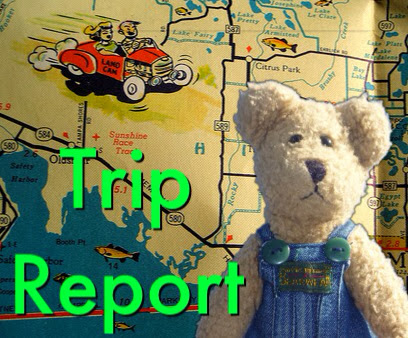 Fort Myers (2 hour drive) was available, but Dave had a hunch that flight would get chopped. Nothing else was available.... We opted to take the flight to Miami (without continuing to Tampa) so we could go hub-to-hub, thinking this was the flight least likely to get canceled. Then, we'd drive the 3.5 hours to Orlando. Looks like it's time to cancel that dinner reservation at Jiko. Holly arrived at Dave's office to pick him up, but she had to come in so we could do some paperwork prepare for the worst-case travel scenario. Since Dave was busy working with airlines trying to scam the first class seats on the later Orlando flight he sent a coworker down to pick Holly up from the lobby. No luck on the first class. Preparing for the chance we would not make the expo we decided to get some paperwork together so friends could pick up all of our required race packets. We printed bib waivers, signed pickup authorization forms, and copied our photo IDs. We scanned them to a PDF and emailed the whole pack to several friends. We get to O'Hare and parked in the long-term lot where you normally take a bus to the train. Usually buses arrive every five minutes. Since we were traveling to Florida we ditched the winter coats and waited it out in one of the shelters. After about 7 minutes we realized that -45 is too cold to be in a shelter with a broken heater. Dave lead the charge to the next shelter, where the heater brought temperatures up to the low teens. Buses were delayed because the monorail wasn't working so all buses were running back and forth to the terminals. We waited close to 25 minutes for that bus. After lunch we sat at the gate forever and the plane was nowhere in sight. Since we were traveling to Disney to meet up with our Team AllEars friends we were tracking everyone's travel nightmares on Facebook. One friend taking off out of Chicago's other airport made it with no issues, while another friend a few hours away ended up driving. Stress level building some more, but hey the flight from Midway left. Still no plane. The staff wasn't offering up much information. About 5 minutes before take-off they tell us our plane is in the hanger being repaired and a decision will be made at 7:00 (90 minutes from that time). Panic time. We know this is not good. Dave got on the phone with the airline and found that seats became available on the Orlando flight, but we could not get on it since our bags were still on an active flight. Holly's stress level started to raise a bit. Dave decided to follow a Disney rule: You don't like the answer, ask another cast member. He took off to try to find a service desk. Ha Ha! They exist on the gate side of security. He then picked up a courtesy phone to speak with an agent. The agent was able to move our bags off the Miami flight and onto the Orlando flight. He printed out boarding passes (with no seat assignments) and presented Holly their new itinerary! Next stop: the bar! About 20 minutes passed since Dave changed flights when the gate announced the Miami flight was canceled and the next option for those passengers would be in the morning. Our flight took off a few minutes late and we arrived in Orlando safely! Holly waited for the bags while Dave handled the rental car. While at the car desk Dave ran into runDisney race announcer, and friend of Team Tizzel, Rudy Novotny. We had a nice chat for a few minutes. Dave headed back to check on Holly and found her in the luggage lost and found office (of course she was first on line). Our bags were sent to Miami. We know this means they won't get to us until later the next day. We were smart enough to pack all of our race items into our carry-ons, but that's it. Nothing else extra. We claimed our car - one of 3 available in the entire Alamo lot. Just happy to have a car, we took off without noticing the car was keyed.... Great! About 12:50 we arrive on Disney property and figure out there's a 24 hour Walgreen's nearby. Time to buy some essentials. We could recycle some of our clothing from the day from hell and use some extra running clothing to fill in the blanks. We had one night booked at Animal Kingdom Lodge. Checked in at 1:30am and checked out at 8:15am. Since we paid cash for breakfast we were able to obtain a blank Disney checkout receipt. Those of you familiar with these sheets will understand the sense of pride. Now for the next stressful event....The Race Expo! Ok, so we ended up being very busy all weekend and had no time to post updates. With races, team meets, park touring, and having fun with friends we never spent any quiet time in our room. We will have full posts coming over the next few days and weeks. We wanted to thank you for supporting our fundraising efforts. This year Team Tizzel raised $11,000 to help fight breast cancer! Thank you so much. The overall Team AllEars total was over $104,000. The total raised by Team AllEars for the past five years is over $330,000 with Team Tizzel's efforts contributing over $30,000 to that total. Thank you all! It's the week of the Walt Disney World Marathon Weekend Extravaganza. Once in Florida we will be participating in a 5k, 10k, half marathon, and Holly a full marathon. We will be spending time with our friends from Team AllEars and celebrating what should be a monumental year of fundraising to fight breast cancer. We'll try to have a quick post everyday (like last year) so you can follow along. On Saturday or Sunday we will reveal how much you helped us raise to fight breast cancer.